To increase protocol efficiency, and to keep transmissions contained within a slot or beam without having to depend on other slots and beams, NR introduces the following four main reference signals. Reference Signals Mapping with associated with different physical channel is depicted in following figure. In NR, reference signals are transmitted only when it is necessary where as in LTE constantly exchanging reference signals to manage the link. The DMRS is specific for specific UE, and used to estimate the radio channel. The system can beamform the DMRS, keep it within a scheduled resource, and transmit it only when necessary in either DL or UL. Additionally, multiple orthogonal DMRSs can be allocated to support MIMO transmission. The network presents users with DMRS information early on for the initial decoding requirement that low-latency applications need, but it only occasionally presents this information for low-speed scenarios in which the channel shows little change. In high-mobility scenarios to track fast changes in channel , it might increase the rate of transmission of DMRS signal (called “additional DMRS”). Multiple orthogonal DMRSs can be allocated to support MIMO transmission. The phase noise of a transmitter increases as the frequency of operation increases. The PTRS plays a crucial role especially at mmWave frequencies to minimize the effect of the oscillator phase noise on system performance. One of the main problems that phase noise introduces into an OFDM signal appears as a common phase rotation of all the sub-carriers, known as common phase error (CPE). It’s main function is to track phase of the Local Oscillator at transmitter and receiver. PTRS enables suppression of phase noise and common phase error specially at higher mmwave frequencies. 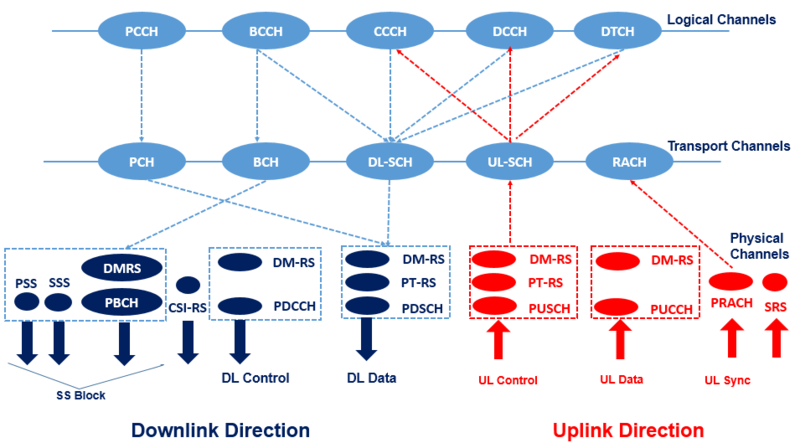 It is present both in uplink (in NR-PUSCH) and downlink (in NR-PDSCH) channels. Due to phase noise properties, PTRS has low density in frequency domain and high density in time domain. As a UL-only signal, the SRS is transmitted by the UE to help the gNB obtain the channel state information (CSI) for each user. Channel State Information describes how the NR signal propagates from the UE to the gNB and represents the combined effect of scattering, fading, and power decay with distance. The system uses the SRS for resource scheduling, link adaptation, Massive MIMO, and beam management. SRS refers to Sounding Reference signal and uplink only signal. The design of SRS and its frequency hopping mechanism is same as used in LTE. As a DL-only signal, the CSI-RS the UE receives is used to estimate the channel and report channel quality information back to the gNB. During MIMO operations, NR uses different antenna approaches based on the carrier frequency. At lower frequencies, the system uses a modest number of active antennas for MU-MIMO and adds FDD operations. In this case, the UE needs the CSI-RS to calculate the CSI and report it back in the UL direction. CSI-RS refers to channel state information reference signal and these signals are downlink only signal. It is used for DL CSI acquisition. 5G NR standard allows high level of flexibility in CSI-RS configurations, a resource can be configured with up to 32 ports. CSI-RS resource may start at any OFDM symbol of the slot and it usually occupies 1/2/4 OFDM symbols depending upon configured number of ports.